This thrilling narrative of a serial killer’s life and the unusual and challenging investigation to catch him, uncovers a chilling trail of unspeakable torment and cruelty – the tale of Raakshas. 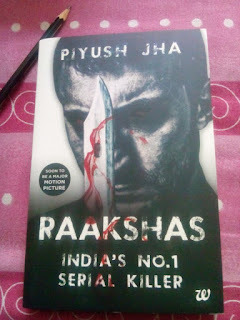 Raakshas himself welcomes readers with his bloodshot eyes and his weapon of destruction. Look into his eyes and you will definitely think twice about reading the book, especially if you are beginning to read at night! Raakshas is a touching story of an innocent boy who is forced by circumstances to become a psychopath killer. One doesn’t get to know his real name, so I will call him R. Labelled a killer at birth and blamed for his mother’s death merely marked the beginning of his life’s atrocities. There was still a lot more to come. A harrowing time with his father followed next. Brahmanand, who saw his son as a mere distraction to his ongoing research, was the major culprit in spoiling his son’s life. After all, it is the parents’ responsibility to provide an environment conducive to the child’s holistic development. The first few pages brought tears into my eyes. “How can a father be so cruel to his own son?” I kept wondering. But then, haven’t we heard stories of scientists who lost it in pursuit of their impossible inventions? The little boy’s perseverance however, impresses us throughout. Gifted with an amazingly sharp brain, the boy had it all in him to become a genius. But, destiny had different plan for him. After months of inhuman treatment by his father, destiny gave R a chance to escape his father’s den and be united with the only mother figure to him in the big, bad world – his maternal aunt Latika. Little did he realise that the journey to his aunt’s place would instead take him to the path of being a serial killer. On his way to his aunt’s place, little R got kidnapped by a baba, a serial killer himself. It was the years of captivity, being baba’s assistant in his heinous crimes that transformed the boy into a serial killer. Throughout the years of captivity, R just dreamt of escaping Baba’s clutches and being reunited with his aunt. Sadly, by the time this happened, his soul had already become a personification of evil. What followed next was a story that could shake the reader to the core. One after another, the tales of his heinous crimes gave me goose bumps. The story has a very strong message - A serial killer is not born but is made. Almost parallel runs the story of a girl, as intelligent as R but much favored by her destiny. An event in her adolescence which could have spoiled her life forever instead became her biggest strength. The girl went on to become a super cop, which brings us our second message – We are what we choose to become, not what circumstances want us to be. The book also highlights the side effects of a practice rampant these days – of media highlighting and exaggerating every little piece of information. Had the media not come up with a silly idea of “ranking of serial killers”, many lives could have been saved. 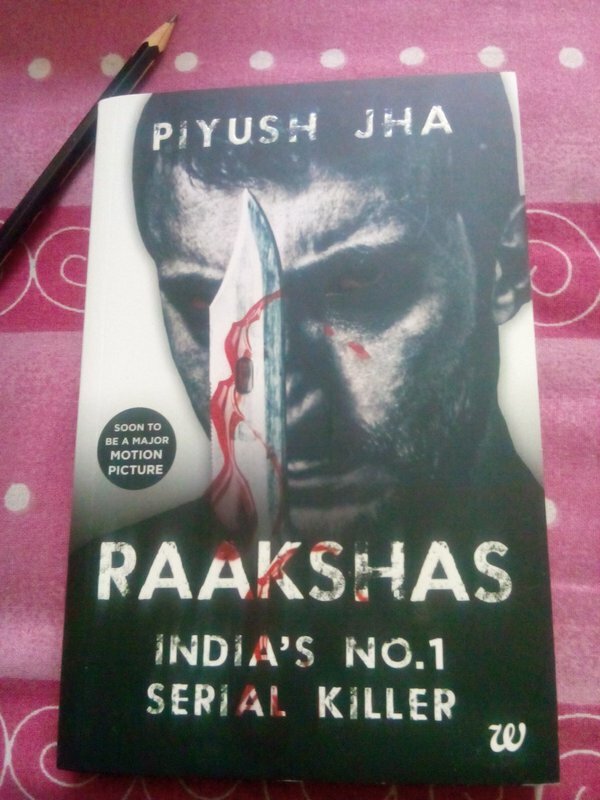 Grab the book, for Raakshas isn’t a book about nabbing yet another serial killer on a killing spree. It goes a step beyond and portrays all that goes around in the minds of serial killers, their fears, triggers, emotions and motivations – the face of devil inside. The parallel tracks of the lady cop and R give the story an interesting “Yin and Yang” touch. Everything, for the story has the power to leave an impact on its readers. Being my first crime thriller I was quite hesitant but the book kept my hooked on until I didn’t finish the last page. As I was glued to the book, the courier boy and a plumber who visited my house were welcomed with my suspicious eyes. Need I say more? Many aspects of the lady cop seemed too good to be true and exaggerated to give her a heroic stature. Piyush Jha is an acclaimed film director, ad filmmaker and author of bestselling crime fiction novels. His films Chalo America, King Of Bollywood and Sikandar are noted for their unconventional subject matter. Currently working on a crime based TV show, Piyush’s earlier novels are Mumbaistan, Compass Box Killer and Anti Social Network. After my delivery, when my intravenous cannula was removed, I rejoiced thinking, “The pain is over!” Little did I know a new challenge awaited me – of witnessing my baby in pain during vaccination! The initial mandatory vaccines were administered by the pediatrician while I was still bed ridden. But, as the date for the next monthly vaccination drew near, anxiety gripped me. The mere thought of the needle pricking my baby’s soft skin and the imaginary sight of my little angel wincing in pain gave me goose bumps.